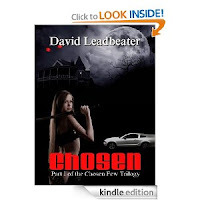 Today I'm pleased to interview David Leadbeater - an author who really THINKS BIG! Jill: It’s all I can do to think of a plot around which to build a book – just a single book. How the heck did you conceive of something so big when you wrote The Bones of Odin as part one of a four part series? You must have tons of post-it notes stuck all over your work space. 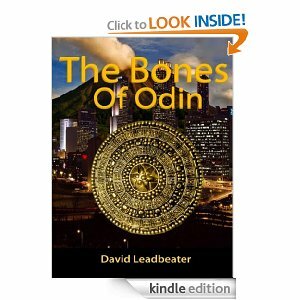 Dave: When I first conceived The Bones of Odin it was as a single book. When I came to the detailed planning and subsequent writing I soon realized that the discovery at the end – The Tomb of the Gods – took us in a whole new direction and opened up some great possibilities. At this point I roughly mapped out the next three books, decided on some cliffhangers, and pinpointed where the stories main revelations should occur. Luckily, I typed everything straight to my computer so am able to easily refer back. When I’m writing the Drake books I usually have 4 different story folders open! Then I have a couple of small A3 notebooks for ongoing story threads or new stuff that suddenly jumps out. Then, if something new sticks I add it to whichever book’s story folder it needs to go in. Jill: In hopes of making one of the greatest ever archeological discoveries, retired SAS officer Matt Drake goes searching for the Nine Pieces of Odin. Tell me about your interest in archeology – do you have a little Indiana Jones in you? Was archeology your major in university (or did you wish it was)? Why did archeology seem like the right backdrop for this series? Dave: I guess my love of archeology is fuelled by an interest in the ancient mysteries that may yet be uncovered. It goes back to my childhood when I used to watch old films on TV, past the Indiana Jones movies, and on through the Da Vinci Code days to present. Of course, I knew archeology had to be involved in my book as the story revolved around ancient artifacts being discovered. Haha! Well… I fully plan the story and every chapter before I write the first word. Of course, anything can change if something new pops up (and I love it when that happens) but I do start with a detailed step by step plan. Then, I jot bullet points for each chapter in a notebook and constantly refer to it as I write, ensuring the flow is maintained as carefully as possible. My editor handles the bulk of the edits which we bat back and forth a few times and then I polish before publication. Being a husband and a father of two young children I have no place of my own! I write where I can and when I have time, usually after the kids have gone to bed. I try to write about 3 pages per day, four or five days a week, but it's not always possible. Your first book hop-scotches from the Louvre, to a Swedish cavern, to the Big Apple, and points beyond. Do you always write about places that you have actually been to? Can you write about real places you’ve never seen? Good question. At this early point in my writing career I’m sticking to places that I have actually visited a few times and can confidently talk about. That is apart from any Scandanavian countries, the descriptions of which I have come unstuck with once and now try to refer to in a general way. No doubt I will soon have to write about a place I’ve never seen and will do extensive research before I put pen to paper. The evil, awful, underworld figure the Blood King sounds, well, evil and awful and pretty darn scary. What’s it like when it comes to writing bad guys... really, really bad guys? It’s not much fun, to be honest. I try not to write much from their POV, but create an aura of evil around them so I don’t have to delve too deeply! Now, almost the total opposite (talking length here) of the four volume Matt Drake series, you also have a short story called Walking With Ghosts. Is it easy to move between long and short fiction? What are the pros and cons of each? Yes, it’s pretty easy. Once I have a detailed story I can just proceed as outlined above. The Pro’s of writing a short story are not having to live with the constant mental stress of writing a novel, and being able to put something new out that means a lot to me in a shorter space of time. I intend – eventually – to have a series of short stories under some kind of ‘Ghostly’ banner, but that’s a fair way down the line. Walking with Ghosts was written to help showcase the city I live in and give a little publicity to the local hospital where my two premature children were cared for so superbly, as well as offering up a few frights along the way! The cons? You can’t really expand on the characters you have created. And you have to end it just when you’re starting to have fun. But it does leave possibilities open for the future…I always like to do that. 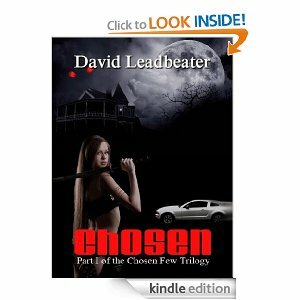 The cover for The Chosen is pretty cool! How do you decide on book covers? Thank you! I talk, through email, to my cover designer and give him a list of storylines and events that occur in the book. He comes back with several suggestions. Then we fine tune and narrow it down. It’s a fun process and always great to see your dream taking shape. Name two authors (living or dead) who inspire you or whom you’d like to emulate. Tell me why. I’ll go for one living and one dead then – In my opinion… JRR Tolkien, for writing the greatest story ever told, for inspiring me in my youth to write long fantasy epics just for fun, and for giving the English language such poetic brilliance whilst alternately shaking, chilling and exciting you to your very core. And, more recently, the crime writer Robert Crais, for giving us the Elvis Cole series of novels and inventing two of the best and most likeable characters of recent times. The last question is kind of a freebie: What is the one thing you wish I had asked you but didn’t? Now go ahead and ask and answer that question. Hey, Dave, when’s your next book out? Well, just came out! 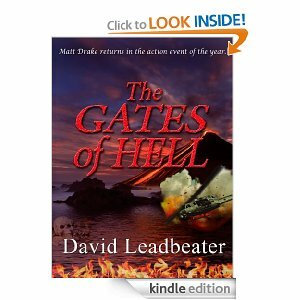 It’s the third in the initial four part ‘Matt Drake’ series, called The Gates of Hell, and starts off where The Blood King Conspiracy finished on its huge cliffhanger- my apologies for that one! Check out Dave's page on AMAZON.